Please purchase the authentic Home Prefer Brand products only Sold by Home Prefer Store for Quality Guaranteed. Others are counterfeits. Thank you! ICOLOR is a worldwide registered brand owned by Shenzhen HENGSHENGTAI E-commerce Co., Ltd. FEATURES: Waterproof, windproof, UV, breathable, quick-drying, ultra-light .It's ideal for fishing enthusiasts, sailors, climbers, camping activities,exploration personnel other outdoor sports; Can be adjustable size,it will fits all the Man /wamen! 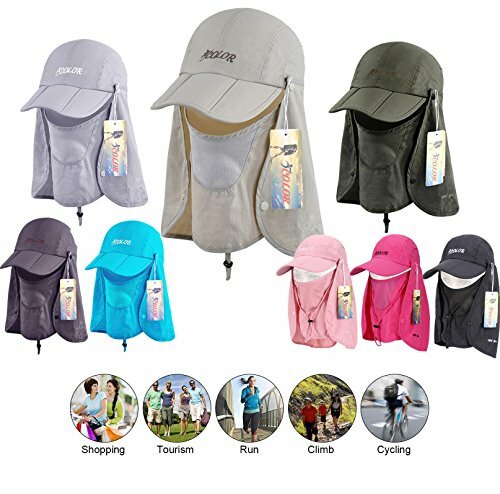 360 degree design protection, sunscreen, UV damage, anti-mosquito High quality Waterproof fabric, Mesh,absorb sweat, breathable, UV resistance. Dark cap eyebrow, absorb strongly scatter light, eye protection ,The back of the hat for the elastic fast buckle, can be manually adjust the size of hat head girth. The Cap may help cooling; the Shield will protect neck and ears from sunburn and the mask can protect face from dust. Click "Add to Cart" above and get your amazing ICOLOR Sun Protection Flap Hat Sun Cap! Legal Statement: Copyright by Shenzhen HENGSHENGTAI E-commerce Co., Ltd. All rights reserved. 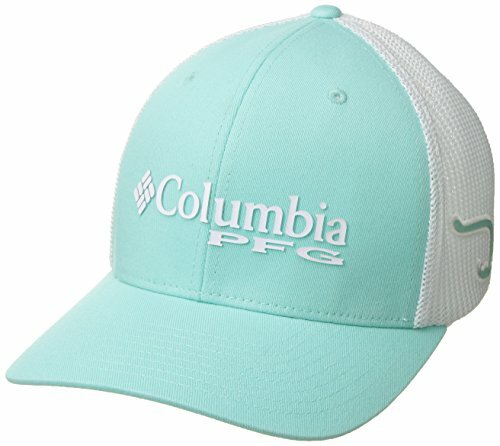 No part of the description above may be reproduced, distributed, or transmitted in any form or by any means, including relisting to Amazon or any online marketplace, photocopying, recording, or other electronic or mechanical methods, without the prior written permission of HENGSHENGTAI E-commerce Co., Ltd.
UPF 50+ PROTECTION: iColor Flap Hats ,Sun Cap UPF 50+ sun protection to keep delicate skin on the neck ears and face safe from harmful rays,The whole surrounded by a large shawl , free removal, sunscreen and breathable. in addition to a removable neck flap and breathable face protector,It protects skin from the elements and the mask can protect face from dust. 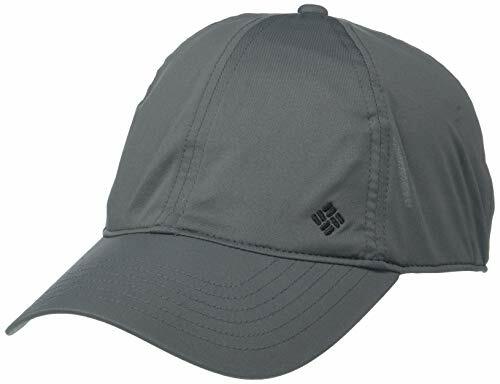 WINDPFOOG WATERPROOF FABRIC: Mesh,absorb sweat, breathable, UV resistance.Dark cap eyebrow, absorb strongly scatter light, eye protection ,The back of the hat for the elastic fast buckle, Windproof design with adjustable chin strap ensures the hat stays put even in windy conditions . FOLDABLE: Our ICOLOR Flap Hats Sun Cap is Portable to fit in your other small bags or purses, can easily be folded and packs well. "UShake" is a registered brand focusing on products assisting to the people who are fond of running, cycling, swimming, snow skiing, and other outdoor activities etc. Organized by a young team, UShake is committed to source premium quality products for you. Our products are designed to help you enjoy sports with greater comfort, convenience, and style. 100% MONEY BACK GUARANTEE: Customer satisfaction is our top priority. UShake hat products come with a 12 month guarantee: if you experience ANY problems with your Anti-Mosquito Hat, we refund your entire purchase instantly. Buy now RISK FREE today and experience the UShake difference! Fabric Composition: Nylon 100%+Polyester+100%. Non-impregnated fabric serves as a natural mosquito repellent and allows good air circulation. SPECIFICATIONS: Head Circumference: 22.8-23.2; Crown depth: 4; Veil: 13.4 long; Brim: 2.95 wide. It fits comfortable over most headwear. Washing Tip: by hand wash below 86 water. 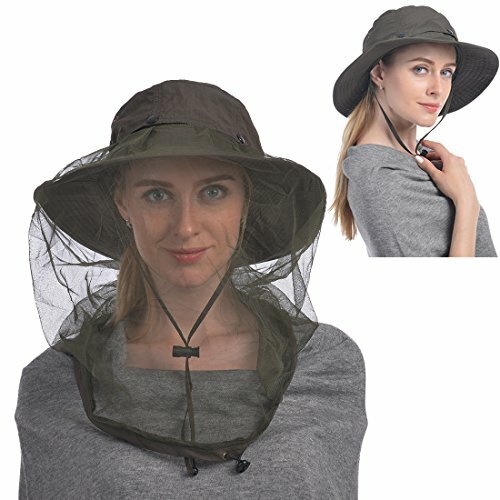 DUAL FUNCTIONALITY: The hat features a hidden mesh net compartment on the top that conceals a full head mosquito bug guard. Simply pull it up, adjust it to the size of your head and you're fully prepared to have an enjoying outdoor activity without annoying mosquitoes, flies, insects and bug. Anti-Mosquito Hat or Sun Hat! Protect you from the sun 3.7 Inch wide brim to protect you from all angles from the blazing sun. It is also 50+ UPF, offering complete UV protection for your face and ears. Functional The hat is lightweight and breathable with its breathable mesh side panels and spandex sweat band to keep you cool during hot summer days. Our adjustable chin strap allows you to be secured on your hat during windy days! Also comes with an adjustable head strap for a perfectly snug fit! Quality Construction and multi colors Made with high quality nylon; The fabric is water and stain resistant. The size is 24 inches head circumference. Sun Cube builds quality performance gear that lets you achieve more out in the sun! At SunCube, we offer premium headwear that protects our customers in the sun and allow them to achieve and perform better in any outdoor activities. Our products are meticulously designed with the finest materials and functions, making them versatile and functional at the same time. 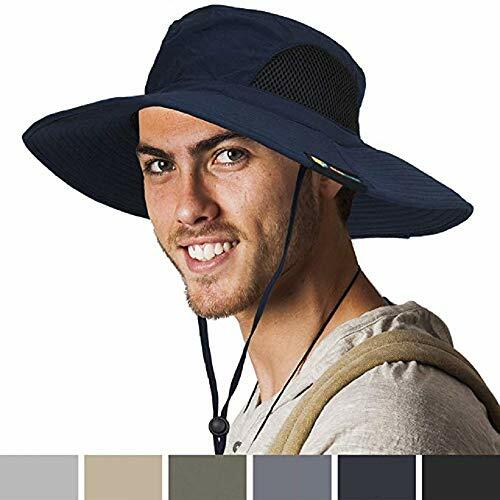 PROTECTION FROM THE SUN - This premium outdoor sun bucket boonie hat comes with a large bill/brim to protect you from all angles of the blazing sun. 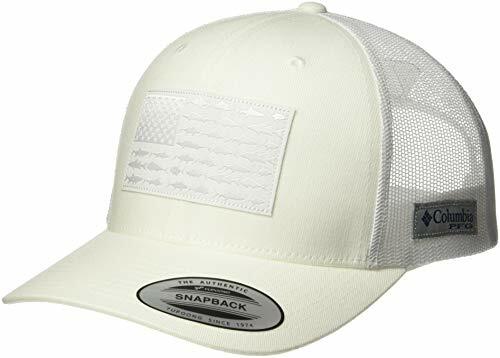 It is 50+ UPF for complete UV ray protection of your face, ears, and neck, making this the ideal hat to keep you cool during long hikes, boat outing, gardening, fishing trips during long summer days. COMFORTABLE AND BREATHABLE - Comes with mesh side panel and moisture wicking spandex sweat band, the hat is also made with nylon fabric that's light and dries quick. 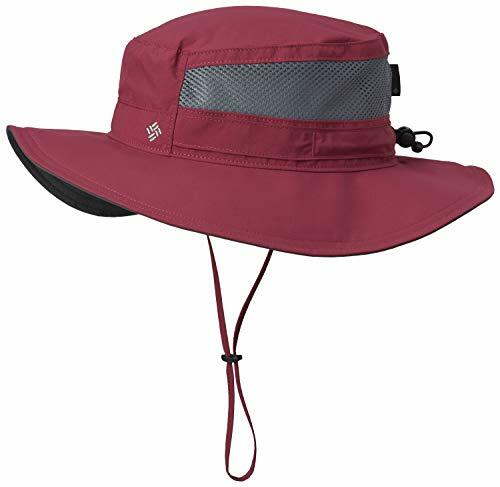 FUNCTIONAL AND VERSATILE - The sun hat has an adjustable chin strap to keep hat secure on windy days and an adjustable head strap to tighten for snug fit in the back. PACKABLE - GREAT FOR TRAVEL AND STORAGE - The hat is foldable and packable making this the ideal hat for any road trips, travel, or weekend getaway! Hat circumference 20"-20.5", sun hat brim 3.5"
UV protection - which can protect children's skin from harm. Enjoy their summer. Foldable hat - This hat can be foldable, which can be put into your bag. When you go out with your kids, it is easier to take without occupying your space. ADJUSTABLE TO FIT MOST SIZE: Rear adjustable drawstring design on the crown for custom fit, suitable for head circumference around 22 - 24.5 inches. Adjustable long chin strip with cord-lock for secure fit and windproof. 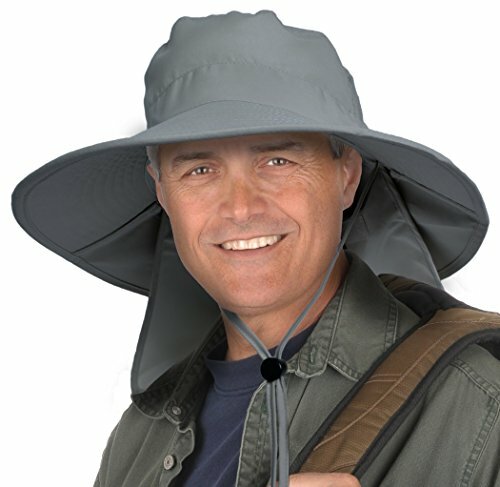 PROTECT YOUR DELICATED SKIN IN ALL-AROUND WAY: Unigear fishing hat features a mosquito net, a breathable face mask and a neck-covering sun shade that offer superb protection to shield your face and neck from harmful UV rays and annoying insects bites. 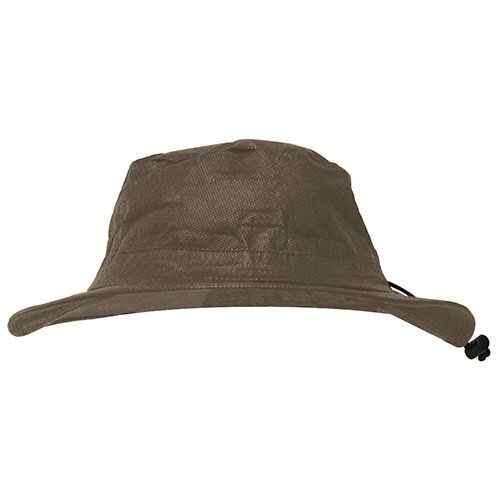 UPF 50+ rating and water-repellent finish on the surface of bucket hat which allow it to be used on shine & rain. 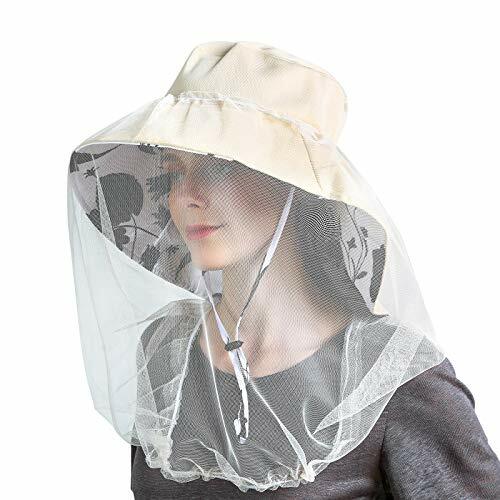 DETACHABLE DESIGN & MULTIPLE WAYS OF WEARING: The detachable face mask, neck cover and mosquito head net ensure its multiple wearing ways - enable to wear it as general hat, windproof hat, neck protection hat, all round protection hat or anti-insects hat. Choose the most suitable type depend upon your protection needs. WICKING & BREATHABLE & PACKABLE: Internal polyester sweatband could draw perspiration away from your brow quickly and strategically placed hole vents and mesh fabric in the crown keep you cool and breathable. Ultra lightweight and packable, only weigh 190g, the hat can be rolled into a tube shape for easy storage and carrying. Best partner for various outdoor activities, like fishing, climbing, hiking, beekeeping. 60 DAYS 100% SATISFACTION GUARANTEE: If you are not 100% satisfied with this product for any reason, please contact customer service within 60 days, and we will immediately refund your purchase price - no questions asked. Head out in to the backcountry wearing the Columbia Coolhead II Ball Cap. Omni-Freeze fabrication helps wick moisture away and provides UPF 50 protection against harmful UV rays. Six-panel construction with curved brim. Embroidered flag patch adorns front. Adjustable back closure. Logo patch at back. Shell: 92% polyester, 8% elastane;Brim: 100% nylon;Lining: 89% polyester, 11% elastane. Hand wash, hang dry. Imported. Measurements: Circumference: 24 in Brim: 2 3 4 in Product measurements were taken using size One Size (6 1/2-7 1/2). Please note that measurements may vary by size. Head out in to the backcountry wearing the Columbia Coolhead II Ball Cap. Made from protective micro-fiber & mesh adjustable! 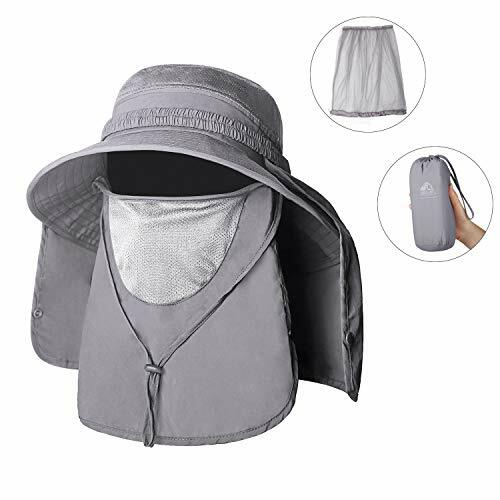 One size fit most moisture-dispersing sweatband, foldable large bill neck flap mesh nets with adjustable drawstring packable perfect for camp, hiking, gardening, traveling, fishing, beach, pool or any other outdoor sport activity in summer! 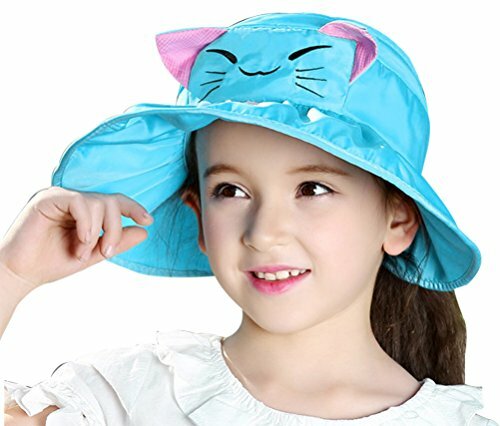 A wide shapable brim sun hat with neck flap keeps sun out of forehead, cheek and neck. Soft and breathable fabric and mesh lining wicks sweat and drys fast, which makes you feel dry, cool and comfortable, enjoying summer. Additional mosquito head net is detachable for convenient use, keep bugs out or act as an ornament. Size adjustment eliminate your worry about sizing. Wide application: camping, fishing, hiking, beach, farming, gardeing, yard work, etc. It is easily foldable, and it has wire in the frame to adjust the brim. WIDE BRIM & NECK FLAP, UV PROTECTION: This hat has a wide brim and neck flap to shade forehead, eyes, cheeks and back of neck from sun uv ray. Brim is 3.9/10cm wide; Neck flap is 6.8/17.5cm long. The hat brim or front brim is foldable and shapable. 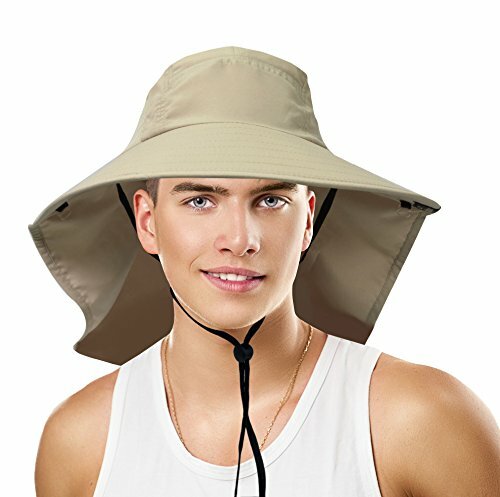 Outdoor summer hat, perfect for beach, travel, camp, hike, etc.